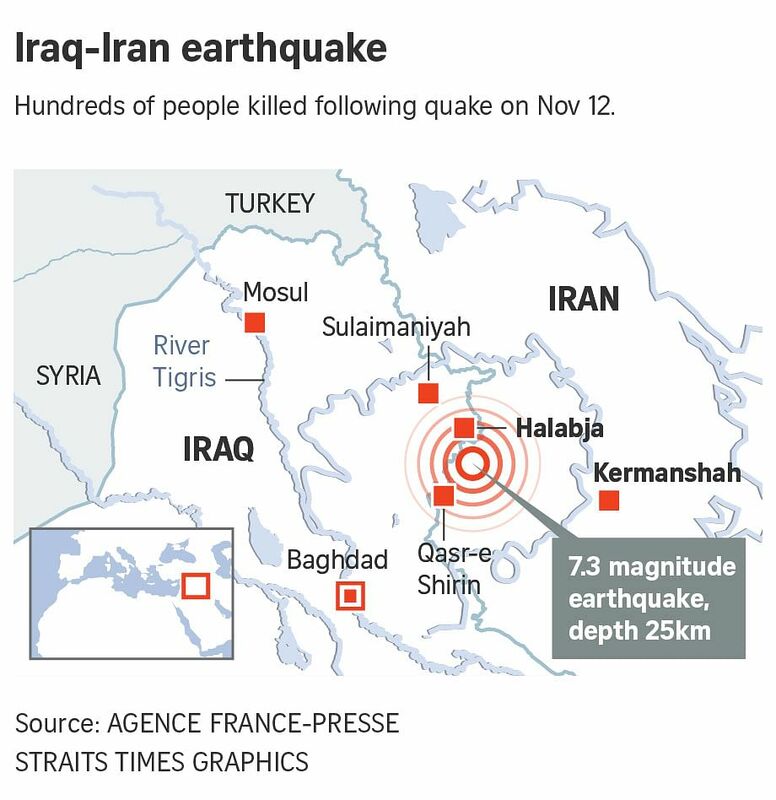 A massive 7.3 magnitude earthquake hit the border between Iraq and Iran Sunday, killing dozens across both countries, according to several media reports. BAGHDAD/ANKARA (REUTERS) – More than 400 people were killed in Iran when a magnitude 7.3 earthquake jolted the country on Sunday (Nov12), state media said, and rescuers were searching for dozens trapped under rubble in the mountainous area. At least seven have died in Iraq as well. State television said at least 402 people were killed in Iran and some 6,650 were injured. Local officials said the death toll would rise as search and rescue teams reached remote areas of Iran. More than 236 of the victims were in Sarpol-e Zahab county in Kermanshah province, about 15km from the Iraq border. Iranian state television said the quake had caused heavy damage in some villages where houses were made of earthen bricks. Rescuers were labouring to find survivors trapped under collapsed buildings. The quake also triggered landslides that hindered rescue efforts, officials told state television. Iranian Supreme Leader Ayatollah Ali Khamenei offered his condolences on Monday (Nov 13), urging all government agencies to do all they could to help those affected. The US Geological Survey said the quake measured magnitude 7.3. An Iraqi meteorology official put its magnitude at 6.5 with the epicentre in Penjwin in Sulaimaniyah province in the Kurdistan region, close to the main border crossing with Iran. Kurdish officials said at least seven people were killed in Iraq and 535 injured. The Iranian seismological centre registered around 118 aftershocks and said more were expected. Iranian Interior Minister Abdolreza Rahmani Fazli said some roads were blocked and authorities were worried about casualties in remote villages. An Iranian oil official said pipelines and refineries in the area remained intact. Iran sits astride major fault lines and is prone to frequent tremors. A magnitude 6.6 quake on Dec 26, 2003, devastated the historic city of Bam, 1,000km south-east of Teheran, killing about 31,000 people. On the Iraqi side, the most extensive damage was in the town of Darbandikhan, 75km east of the city of Sulaimaniyah in the semi-autonomous Kurdistan Region. The district’s main hospital was severely damaged and had no power, Rasheed said, so the injured were taken to Sulaimaniyah for treatment. Homes and buildings had extensive structural damage, he said. In Halabja, local officials said a 12-year-old boy died of an electric shock from a falling electric cable. Iraq’s meteorology centre advised people to stay away from buildings and not to use elevators in case of aftershocks. Residents of Turkey’s south-eastern city of Diyarbakir also reported feeling a strong tremor, but there were no immediate reports of damage or casualties there. earthquake and that Turkey’s national disaster management agency, AFAD, and National Medical Rescue Teams were also preparing to head into Iraq. earthquake.” Iran refuses to recognise Israel.